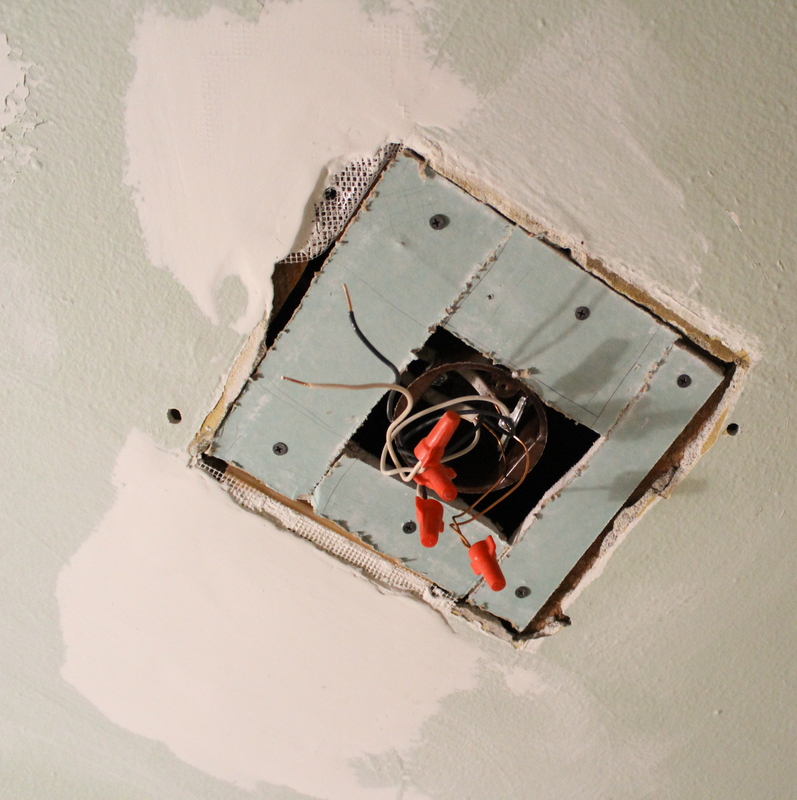 I’ve been working most days chipping away at fixing the ceiling in the baby’s room…and it’s finally over! (Just the fixing part, not the paining part) And the light has gone up! I’ll be honest, my husband has rolled his eyes more than once in regards to me going out and buying this fixture and then complaining about how much work it has taken to patch up the ceiling. His solution was just to patch the small area visible underneath the old larger fixture, and just reuse it. Too Easy I say! There needs to be a challenge! And plus I love this light fixture! 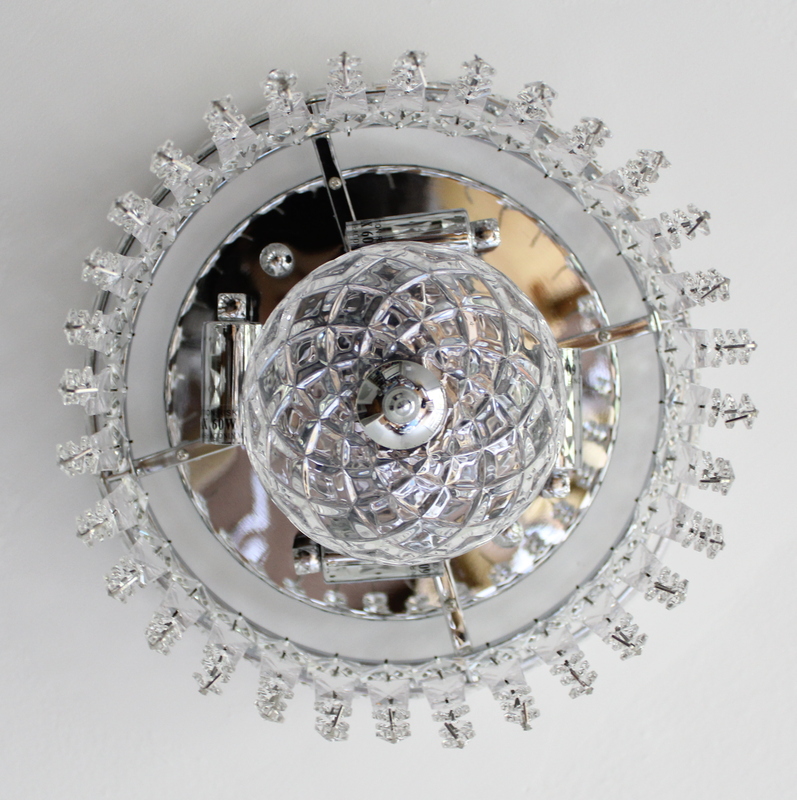 I’ll tell you why…my grandma, Nana, used to have a very similar light fixture in her entry way. It wasn’t very large, but had crystals hung much in the exact same way as this one. I used to LOVE it! I would just stare at it and watch the light reflect on the ceiling. When we would go down to Portland and visit, I would ask her if we could clean it. It was a treat that I would look forward to. (I was a gullible kid, huh…asking to clean? I hope this baby gets that from me :) She would stand on a chair and disconnect each strand and hand them down to me. Then we’d wash them and put them back up, the light sparkling like new! I imagine our little girl being mesmerized and intrigued by the reflections much as I was when I was young. 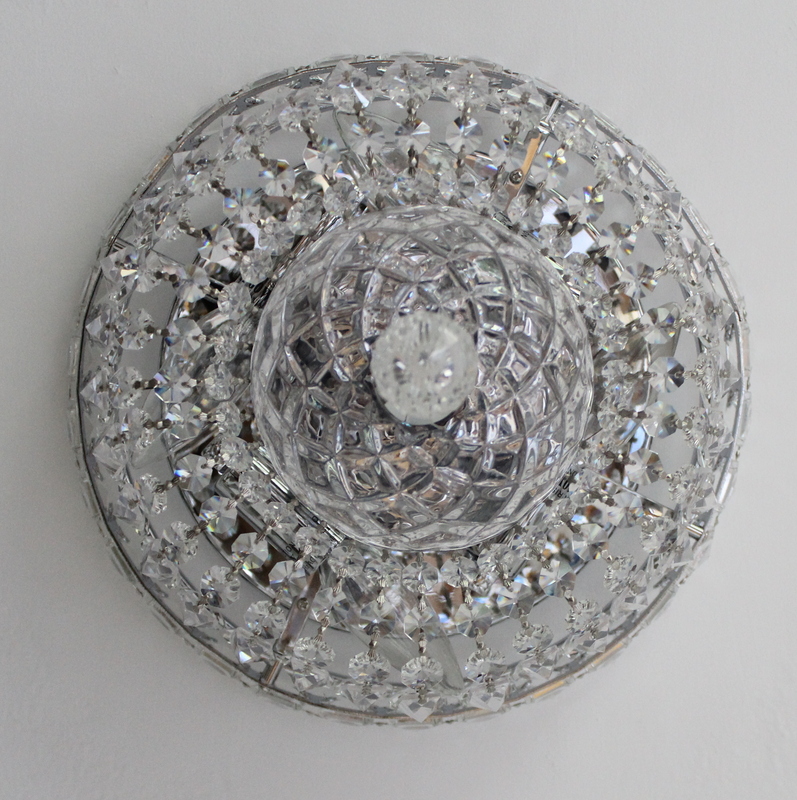 Anyway I just loved looking at it, and this light fixture reminds me of Nana. 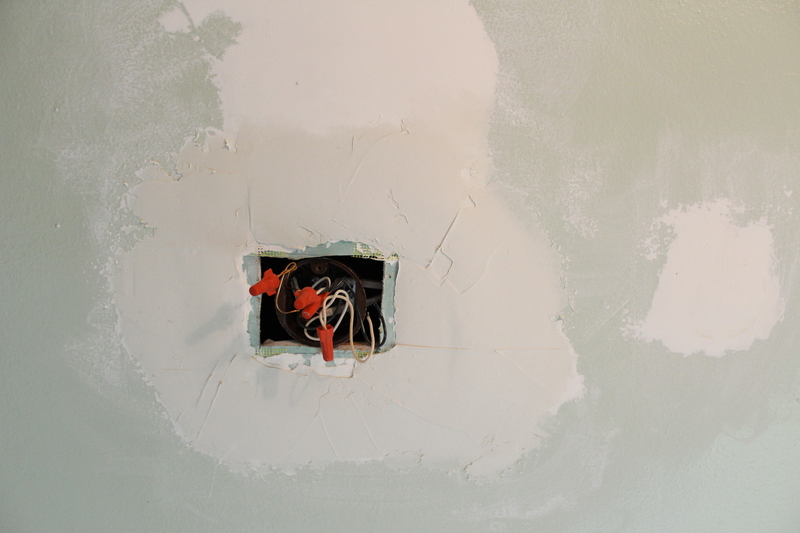 Let me back up…last I left off, the ceiling patching was here. I felt pretty good about it and was thrilled to get to move to the priming stage. Too good to be true? Yes, it always is. The good news is that I listened to the little voice in my head that said I should wait for the light fixture to arrive so that I could double check that there were no gaps or holes around it. 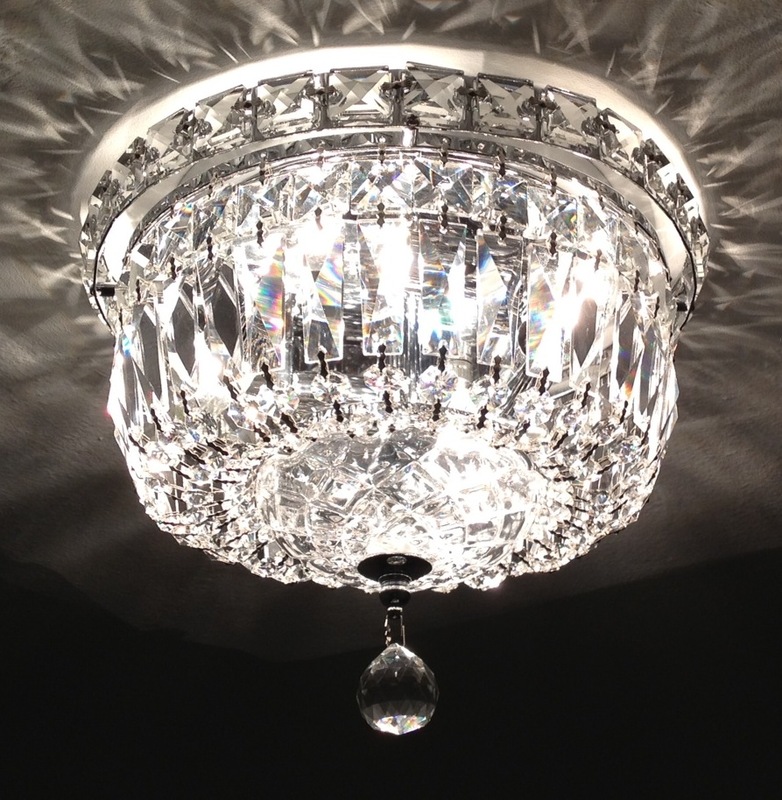 The fixture was advertised as 10″ in diameter which would just barely have fit over the hole. 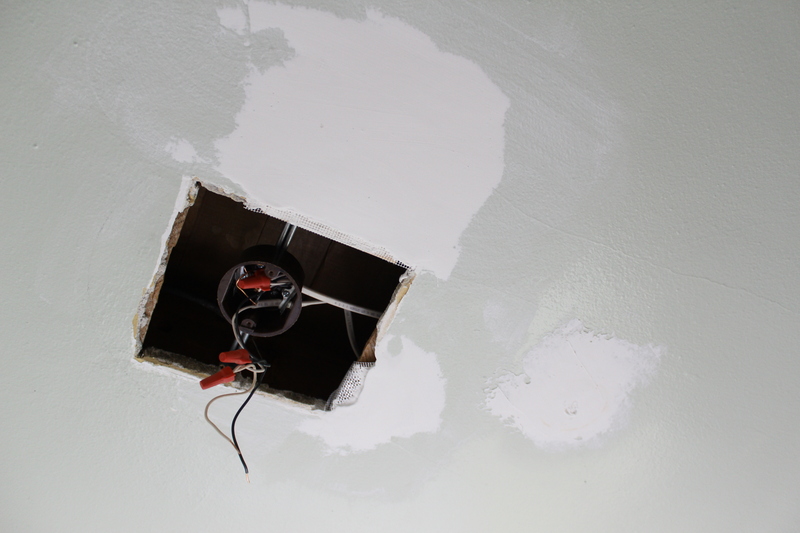 And for the bad news…the part that’s actually flush mounted to the ceiling is only 7-8″ in diameter. 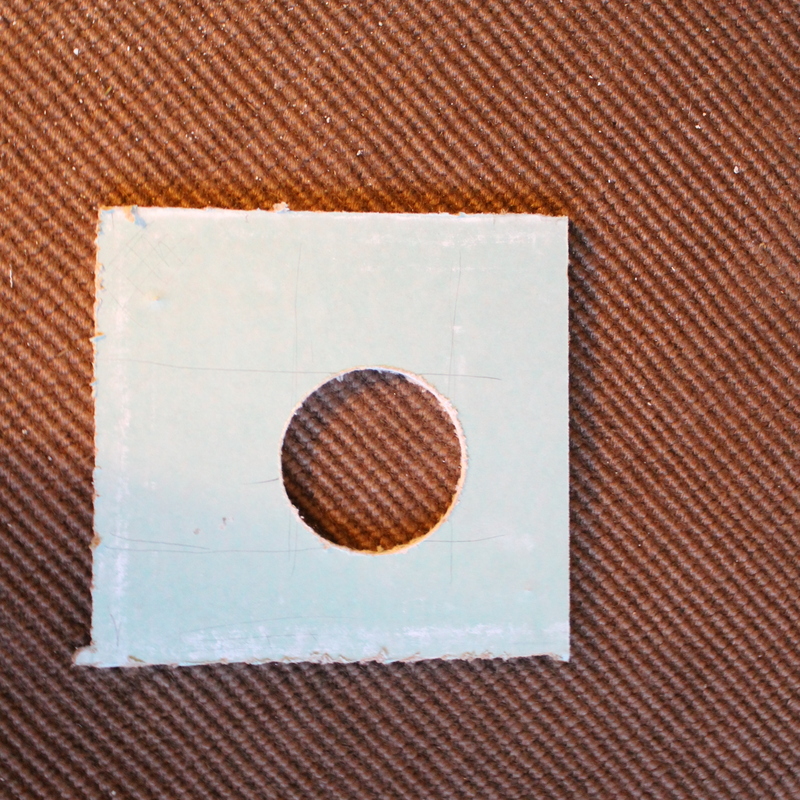 It then has an outer ring that hits 10,” which meant that I needed to patch the hole smaller. I started by screwing in small planks of wood to the back of the lathe for support, and which to attach the drywall to. 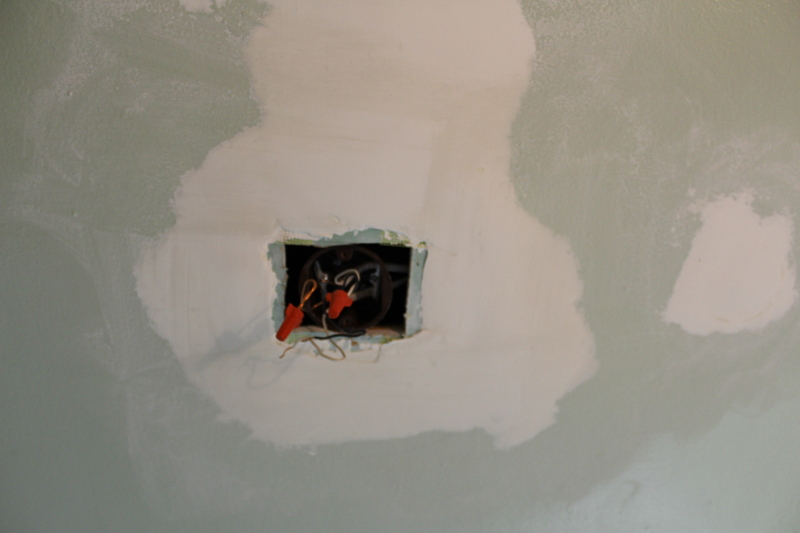 I cut out a nice piece of drywall with a perfectly placed hole in the center to accommodate the junction box. Unfortunately though the junction box was about a half inch too larger, so I had to get a little creative and cut 4 pieces and screw them on to the brace around the junction box. It turned out looking not half bad. 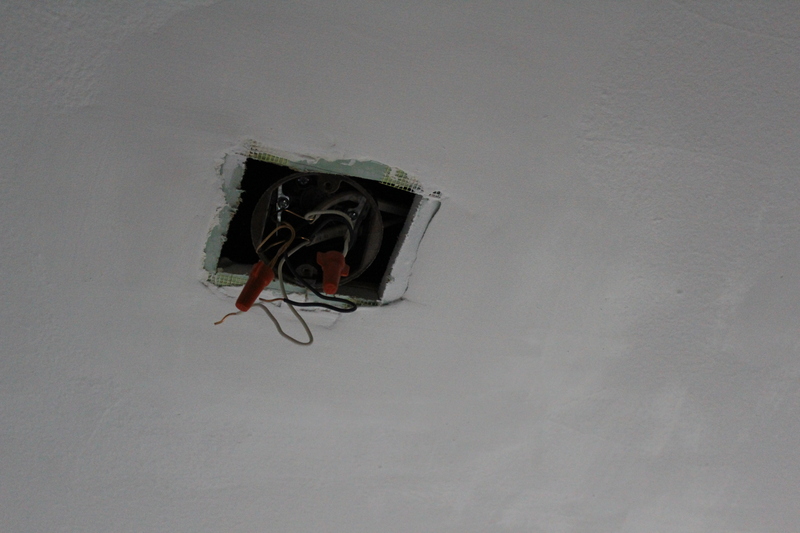 I wouldn’t say great…our ceiling is plaster that is definitely showing it’s age…I mean after all it’s 73 years old! Talk about needing a facelift! This was the best part. The ceiling struggle was over and it was all smooth sailing! I got the fixture up and wired. 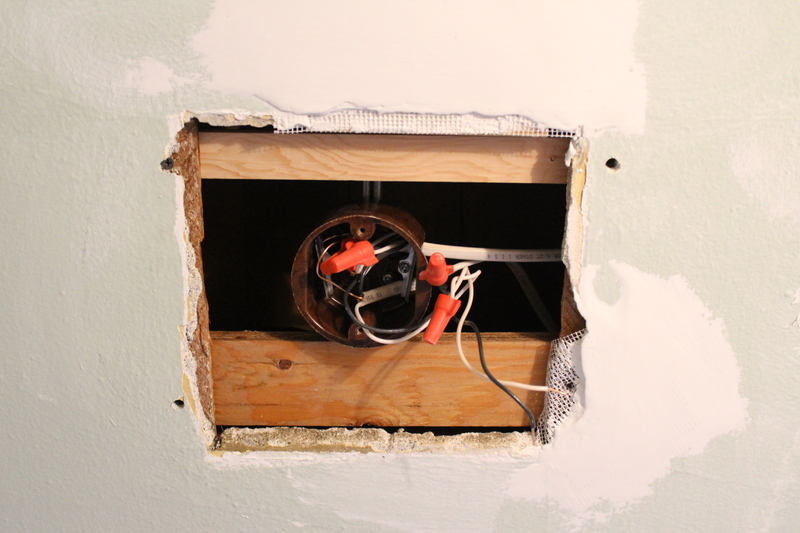 I am not doing to do a “how to wire a light fixture” because I am in no way an expert and am in no position to give advice on electrical wiring. I did double check everything with an electrician friend to confirm I was doing it correctly. I’ve done it a few times, but being in the baby’s room, it seemed super important that it was done correctly. 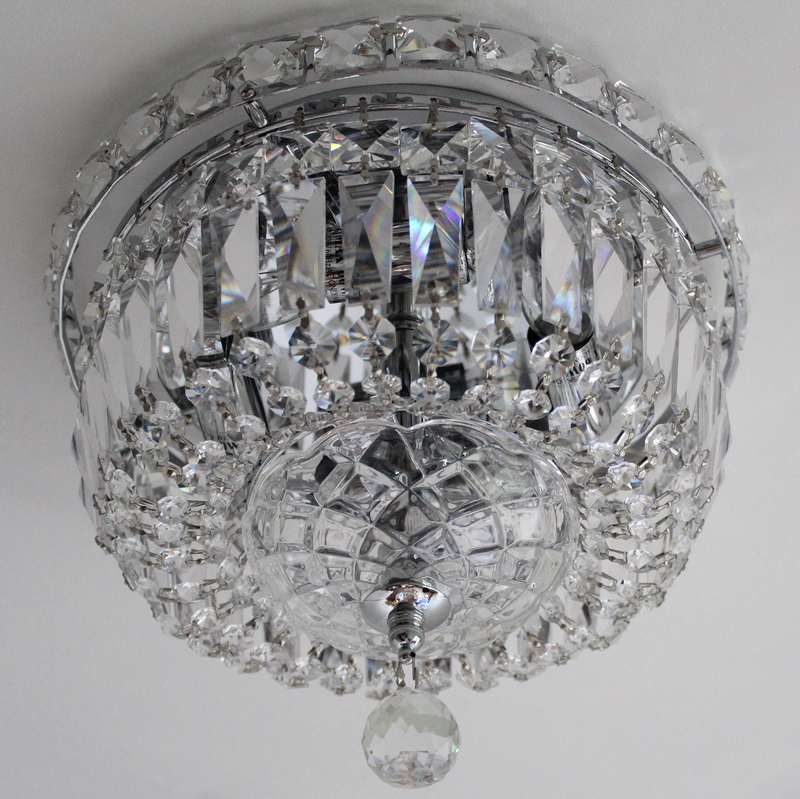 I was so excited to get this finished, I hung the fixture before work, then I came home on my lunch break to hang the crystal strands. It looked pretty cool just dangling straight down, but didn’t have the same polished look. After work, I came home and got all the crystals connected to the lower bracket…and it was finished!! Ahh, what a sight to behold! I love it! I look forward to the time I am going to spend in this room once the baby is born. Unfortunately right now, the room isn’t the most enjoyable to spend time in…do I dare pan out to show the rest of the bed room? Yes, we still have a ways to go. I only did a little priming and paining in the areas that I had patched. I’m leaving the rest of the ceiling up to Jesse, then we will tackle the walls! Hopefully not too far behind. The dinning room is started to collect stacks of boxes of clothes. I went out and bought storage bins to organize all the clothes by age. The downside is that I don’t really have anywhere to put the boxes yet…In time :) I’m aiming for the walls and ceiling to be painted in 3 weeks. Then we can move in the rug and dresser, then curtains, a bookshelf, a chair, oh can’t wait! That’s actually a perfect light for a baby’s room! 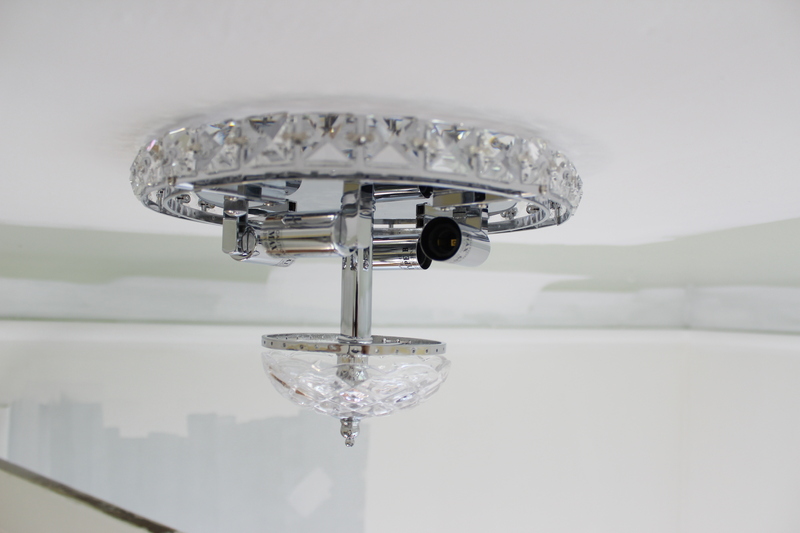 Babies always seem fascinated by light and light fixtures, and this one is sure to be entertaining! Wonderful job Emily! I remember the light at Nana and Skips. Good choice as a memory of your roots. You’ve made the installation process of this light look so simple! It truly is beautiful and perfect for the room!